WHAT IS DENTAL FIBER TECHNOLOGY? Dental fibers could be compared to glass fiber and reinforced steelwork as is been used in the building industry. On this smaller scale, the reinforced restoration or framework provides a very strong and durable product that is now being applied in the mouth to withstand everyday chewing and biting forces. 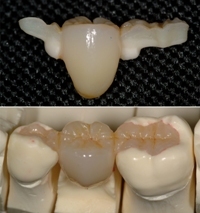 Composite restorative materials are tooth-coloured fillings that are bonded with a resin to the teeth. No undercuts are necessary as in traditional materials and this act as a very non-invasive and patient friendly restoration. The fiber addition to this material greatly enhances the strength, adding more flexibility. Bigger fillings are now possible! After root canal treatment a tooth is very weak in structure and a post is often placed to strengthen it. Fiber technology introduces the anatomical post, which has the following advantages comparing to other traditional posts. Placement of these posts often strengthen the tooth enough to delay the immediate need for crowning the tooth. One of the treatment options of this technology offers the replacement of metal retainers and splints with an aesthetic solution. After orthodontic treatment the patient is very often left with a metal retainer to prevent any further movement of the teeth. These metal retainers often make it difficult for the patient to keep these teeth clean. The un-bonded middle teeth very often still move leaving the patient very frustrated. Tooth coloured fibers provide both an aesthetic alternative and prevention of middle teeth movement. After the extraction of a tooth it is often necessary to place a space holder across the gap to keep the space from closing until further treatment is due. Tooth-coloured fibers provide the cosmetic option. Many times after an accident to the teeth, some of these teeth are loose and get splinted together using a wire-system. Tooth-coloured fiber splints provide the cosmetic alternative. Loose teeth resulting from Periodontitis / Gum Disease are sometimes splinted together as a temporary measure or long-term treatment to prevent movement. Tooth-coloured fiber splints provide the cosmetic alternative.